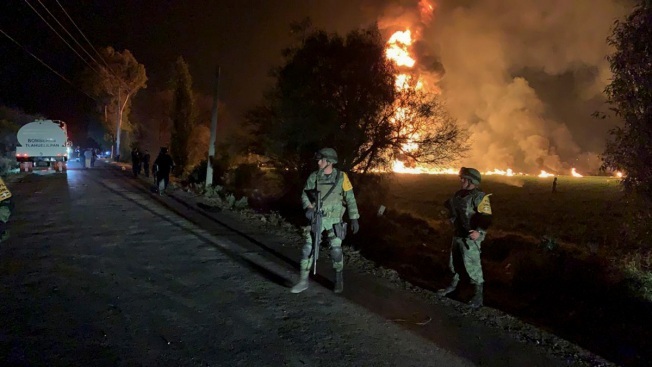 In this image provided by the Secretary of National Defense, soldiers guard in the area near an oil pipeline explosion in Tlahuelilpan, Hidalgo state, Mexico, Friday, Jan. 18, 2019. "It was the popular tap," said Enrique Cerron, 22, who lives near the field. "You could pass by at 11 or 12 in the morning and see people filling up here." A fireball erupted at the site of a fuel pipeline leak after it appeared to be ruptured by thieves. Tlahuelilpan is a largely agrarian community located 90 minutes by car from the capital and just 8 miles (13 kilometers) from the state-run Tula oil refinery. It's surrounded by verdant alfalfa fields and power plant stacks, and is reasonably affluent by rural Mexican standards. Hidalgo state data shows about half the community lives in moderate poverty, in line with the national average. That's when a man rammed a piece of rebar into a patch, according to Irma Velasco, who lives near the alfalfa field where the explosion took place, and gasoline shot 20 feet (6 meters) into the air, like water from a geyser. "They looked like zombies trying to get all that gasoline out," says Cerron. He passed soldiers warning would-be scavengers to stay away. It's going to explode, they said. And it did. Once home, Cerron turned for one last glance at the gusher. Instead he saw flames. The fireball that engulfed those scooping up gasoline underscores the dangers of the epidemic of fuel theft that Mexico's new president has vowed to fight. But Attorney General Alejandro Gertz ruled out bringing charges against townspeople who merely collected spilled fuel, and in particular those hospitalized for burns. "Look, we are not going to victimize the communities," he said. 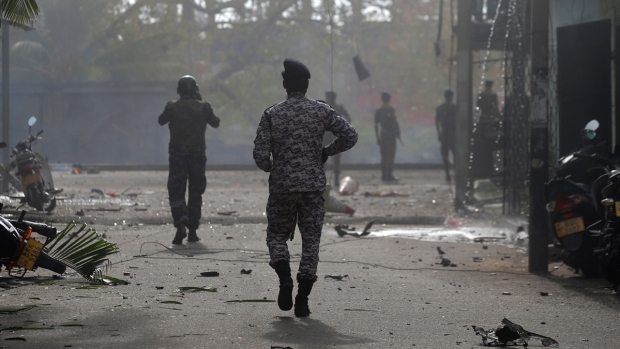 "We are going to search for those responsible for the acts that have generated this tragedy." Officials say pipelines in and around Tlahuelilpan have been perforated 10 times over the past three months. But Pemex has long been plagued by corruption. Lopez Obrador described the company on Sunday as "at the service of people without scruples," saying Pemex had been kidnapped by "a gang of ruffians," referring to crooked government officials and executives within the company. "Mexico needs to end corruption," Lopez Obrador said Sunday. "This is not negotiable." Associated Press writer Amy Guthrie contributed to this report.